Scarlets were left shell-shocked as Cardiff Blues completed the double and kept their Pro14 play-off hopes alive. First-half tries from Owen Lane, Aled Summerhill, Josh Turnbull and the flawless boot of Gareth Anscombe gave Blues a 38-0 half-time lead. There was to be no Scotland Six Nations-inspired comeback for Scarlets. But two tries from substitute Rob Evans and a late interception by Ioan Nicholas made the score more respectable. Blues' only sour note of the night was losing Josh Navidi in the second minute with a suspected dislocated elbow, but even he left the field with a wry smile - perhaps he knew what was coming. Navidi had started the match along with his fellow Grand Slam winner Gareth Anscombe, while Scarlets kept the likes of Ken Owens, Rob Evans and Gareth Davies on the bench. 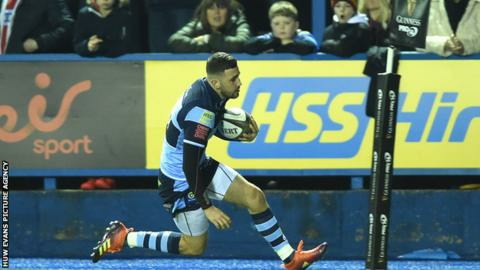 With both Welsh sides in the hunt for top-three finishes in their respective conferences, and the Blues looking to make the play-offs for the first time, it was the break of Navidi's replacement, Shane Lewis-Hughes, which set up Lane's opening score in front of a 12,000 crowd at the Arms Park. With half-backs Jarred Evans and Tomos Williams pulling the strings, Summerhill and Turnbull crossed soon after as Blues entered cruise control. In contrast, Rhys Patchell looked out of sorts against his former side, kicking the ball into his scrum-half, having a clearance kick chased down and missing a tackle on Willis Halaholo which led to Summerhill's second. With the clock in the red and a bonus point already in the bag, Blues went for the jugular when they opted to keep the ball alive. It paid off with Evans' pinpoint cross-kick plucked from the air by Lane - who in the week the Blues announced the signings of Wales wings Josh Adams and Hallam Amos - proved what an asset they already have to cross for his second. Scarlets were left to rue their indiscipline after a one-sided affair and no clearer was it summed up when Keiron Fonotia thrust his knee into the side of the immovable Olly Robison. As expected Wayne Pivac made changes at half-time, with Ken Owens, Rob Evans and Gareth Davies all entering the fray, and Patchell making way for Dan Jones. Wales wing Steff Evans soon followed and added some much-needed spark to the attack. It did not take long for them to make an impact with wing Nicholas crossing the whitewash, but his effort was ruled out after Tomos Williams' foot caused him to lose control while grounding. Gareth Davies also had an effort denied thanks to the defensive efforts of his opposite number Williams and Lane. Scarlets eventually got on the board with Evans muscling over the line after a spell of forward pressure. The Wales prop crossed again, with Scarlets taking advantage of the extra man following Dillon Lewis' yellow card for collapsing the scrum, but soon after left the field with a shoulder injury. Nicholas scored from a late intercept, but with time against them Scarlets fell short of a losing bonus point. Blues head coach John Mulvihill said: "I had this feeling all week that it was either going to be really tight or we'll blow them away. "The first half was outstanding. "We've got so many attacking threats and if we use the ball properly, and we get a good stream of lineout ball, we're going to be hard to stop." Scarlets head coach Wayne Pivac said: "The game was over at half-time. "Going into half-time, it was probably the most disappointing 40 minutes in the near five years that I've been here. "We made some changes in the second half and we performed the way we wanted to from the first whistle. "To be fair, the guys that came on made a huge impact." Cardiff Blues: Anscombe; Lane, Lee-Lo, Halaholo, Summerhill; J Evans, T Williams; Gill, Dacey (capt), Arhip, Turnbull, Thornton, Navidi, Robinson, Williams. Replacements: E Lewis, Carre, D Lewis, S Davies, Lewis-Hughes, L Williams, Millard, M Morgan. Scarlets: Halfpenny; McNicholl, Fonotia (capt),Asquith, Nicholas; Patchell, Hardy; W Jones, M Jones, Lee, Rawlins, Cummins, Macleod, J Davies, Cassiem. Replacements: Owens, R Evans, Kruger, Helps, Boyde, G Davies, D Jones, S Evans.